(Bloomberg) -- The first shipments of U.S. humanitarian aid for Venezuela arrived at the country's western border Thursday, setting the stage for a clash with the government of President Nicolas Maduro, who has pledged to block the supplies. Two trucks arrived in the Colombian border town of Cucuta, and took the supplies to a warehouse next to an unused bridge that connects the countries. More deliveries are expected soon, though the scale of the need is immense. The supplies will be sent into Venezuela next week, opposition lawmaker Gaby Arellano said in a phone interview. Venezuela's security forces used freight containers and a tanker trailer to cut off the span, and are patrolling the dry riverbed nearby. 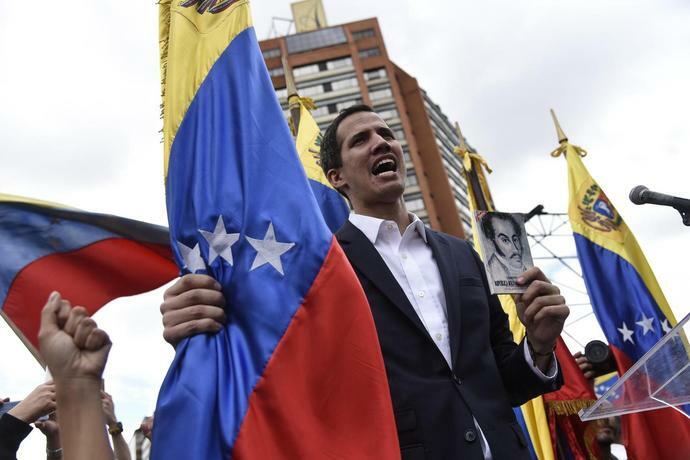 Juan Guaido, the Venezuelan National Assembly leader recognized as the country's rightful leader by more than 30 governments, is using the aid to pressure Maduro's authoritarian regime and demonstrate his ability to help the masses. But Maduro has said the effort is a pretext for invasion, and there's no sign that his armed forces will let the shipments through. Under Maduro's failed socialist policies, Venezuela has sunk into a humanitarian crisis, and hunger is common in the once-wealthy petrostate. Children beg for scraps and adults pick through garbage hoping to feed their families. U.S. sanctions on the oil industry, the government's only real source of hard currency, threaten further suffering. Those regulations, which were rolled out last week, are part of a two-pronged approach by Guaido and his U.S. backers -- strip Maduro of cash to buy even the small amounts of food he's been handing out to Venezuelans, and then ride to the rescue with critical supplies of their own. The U.S., Canada and European Union have pledged $100 million in aid at Guaido's behest. That represents only about two weeks of food and medical imports, said Francisco Rodriguez, chief economist at Torino Economics in New York. Guaido has said supplies will come through Colombia, Brazil and a Caribbean island, but the initial flash point is at the Cucuta bridge. The opposition will find a way to bring aid in, roadblocks or not, said Congresswoman Manuela Bolivar, a member of Guaido's Popular Will party who is helping coordinate the plan. "Venezuela is not an island. There are trails, and thousands of kilometers of territory that the aid could enter through, and we're also looking at maritime options," she said in an interview. "You have to generate pressure." Humanitarian agencies have been wary, because they say relief should be without any agenda. United Nations spokesman Stephane Dujarric said Wednesday that help should arrive without strings. "When we see the present standoff, it becomes even more clear that serious political negotiations between the parties are necessary," he said. "Humanitarian action needs to be independent of political, military or other objectives." On Thursday morning, hundreds of Venezuelan families flowed over Cucuta's bridges across the Tachira River. Some dragged empty suitcases, planning to stock up on staples such as rice and chicken in Cucuta's supermarkets. Others were leaving Venezuela for good. At the end of the Simon Bolivar Bridge, some get straight onto buses to make the 900-mile trip to Ecuador. Street hawkers offer packets of ibuprofen, acetaminophen and generic Viagra, all difficult to obtain back home. It isn't clear how aid deliveries will cross the border in the other direction. While Cucuta has two bridges open to foot traffic, the now-blocked Las Tienditas highway bridge is empty: By the time it was finished, relations between Colombia and Venezuela had deteriorated so much that it isn't used. The aid shipments seem unlikely to inaugurate traffic. The Red Cross's Venezuela chapter said this week it is willing to distribute aid but wouldn't bring food and medicine into the country in defiance of Maduro. Mario Villarroel, the organization's president, spoke to reporters in Caracas about the group's "fundamental principles of impartiality, neutrality and independence." Cucuta has been swamped by Venezuelan migrants, but Colombia's National Emergency Management Agency said in a statement that the aid wouldn't be distributed there. Meanwhile, time is of the essence. As the U.S. oil sanctions imposed Jan. 28 start to bite, the country will face grave difficulties importing food and the gasoline with which to distribute it, Torino's Rodriguez said. Venezuela faces "a very serious risk of famine in the near term," he said. --With assistance from Alex Vasquez, Fabiola Zerpa, Ezra Fieser and Oscar Medina. Chinese ride-hailing giant Didi Chuxing said on Monday it is beginning to recruit drivers ahead of its launch in Colombia's capital Bogota in the coming months. "We have arrived in Colombia with an attractive offer for those who want to register as drivers and we hope to be able to meet the market's expectations," the company said in a statement. The statement did not specify when Didi's services would begin in the Andean country.